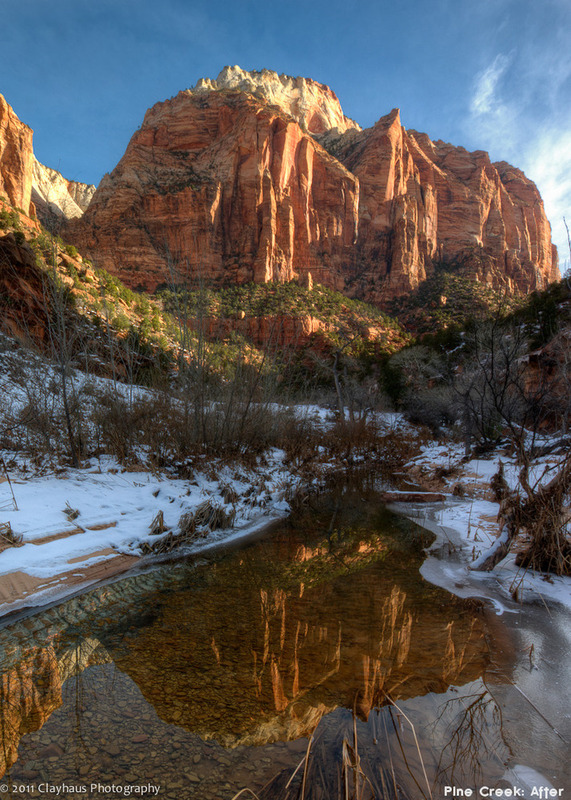 The Wasatch Camera Club brought George Lepp to town for an all day presentation/lecture. Coincidently, a few days before the workshop the club had its bi-monthly competition and we asked George to act as the sole judge. He was happy to do so. For me, the highlight of any of the competitions is the critiquing. In this case, we were not disappointed. George gave some of the most pointed but even comments we have yet heard. He was helpful and suggestive, complimentary and questioning, and I saw several people taking notes. He can back up his statements and suggestions with decades of photography experience, not to mention his years on the editorial board of Outdoor Photographer. That does not mean we as photographers – aspiring and established – need to agree with, or incorporate every critique and suggestion he (or, any other pro) makes, but we do need to listen. Two of my images he spent some time analyzing. I took mental notes and re-processed them accordingly. Not surprisingly, his suggestions do make both images stronger. Though, that is just my opinion and yours may vary. 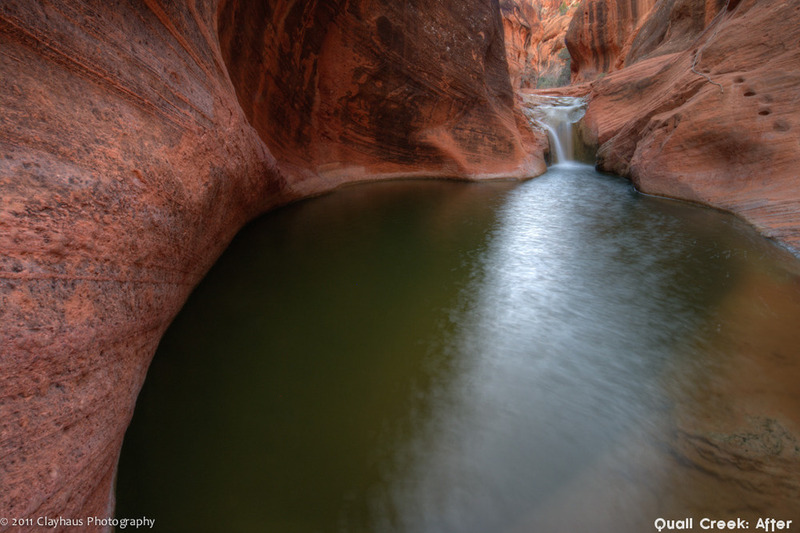 First, Quail Creek: he overall liked this image and thought that it was a wonderful spot to photograph. However, he really objected to the whitish sky. Our eyes are drawn to bright, contrasty objects and he felt that the sky was exactly that culprit. I frankly never felt that way about the image and instead looked at the light reflection in the water leading to the sky as a natural leading line through the photo. Of course, the sky, lacking clouds or other features of interest, is pretty boring. But, I reasoned, it is a relatively small part of the image. You can see this in the ‘Before’ image. Taking his suggestion to heart I cropped the image but maintained the aspect ratio. See ‘After.’ A bit skeptical at first, I now feel that the ‘after’ shot is stronger. Instead of your eye wandering off the photo through the white sky, it now follows either the left curving wall or the light reflection to the waterfall, which is the natural center of the image. The Moki Steps on the right wall are even helped (despite cutting off the first two) by naturally entering into the image. 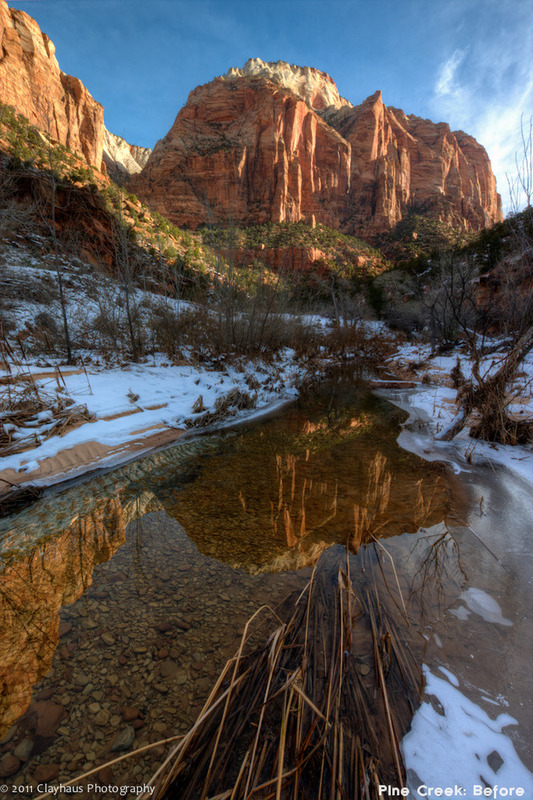 The second image, Pine Creek, was taken on a cold morning in Zion, this past January. I’ve always liked elements of this image, but at the same time there was something that bothered me a bit. What was it…? Oh, I know: busyness! This a very cluttered image and George basically intimated that it made him “back away” from it. Having Mr. Lepp back away from your composition is not a good thing! Simplify, simplify, he said. One way to do that, is to concentrate on the distant cliffs and their reflection by cropping the image. He also suggested toning down the bluish shadow tones in the snow. Finally, he was not terribly happy about the scrubby winter trees in the mid-distance. Accordingly, I cropped the image into a 8x10 format and removed some of the blue saturation from the snow. There wasn’t much I could do about the mid-distance scrub-trees, but I also felt that the re-crop actually opened them up a bit. The result? You can the differences in the ‘Before’ and ‘After’ images, and again – because of the reduction of busyness and concentration of subjects (red cliffs and their reflection) – the ‘after’ image appears stronger to me. I realize that my tendency – especially with the use of ultra wide angle lenses (these were both shot at the widest extreme of my 10-20mm) – is to include too much and too many. Too much of the landscape is not always a good thing because often it will bring in too many subjects and/or too many undesired elements. Simplify, George sez and he is right. Strong, uncluttered compositions with one primary focus of interest can be the most effective type of image. Well expressed, consider well heeded. 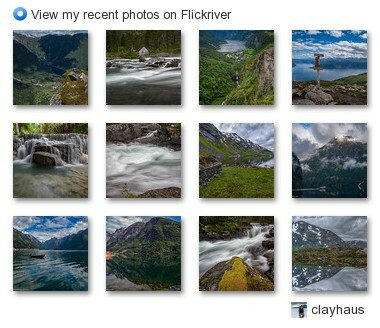 Nice post and photos. I really like the simplified "after" composition of Pine Creek. For Quall Creek, I am wondering if you cropped too much. Have you tried one with just a touch of white sky at the top of the image?